Home / Stock Picks / Stocks to Buy / Can STMicroelectronics (STM) Stock Continue its Run Up? STMicroelectronics NV (NYSE: STM) stock is up nearly 60% year to date, so it’s not a surprise that some people are a bit concerned that it’s flying a little close to the sun at this point. However, market research firm Global Markets Insight predicts that the embedded computing sector (which includes Internet of Things as well as new smart and driverless car technologies) should see 57% growth by 2023. That would make this sector a nearly $260 billion industry. 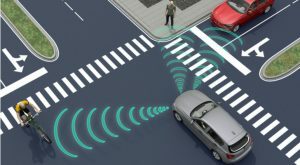 Basically, embedded computing is how we make “dumb” things “smart” — for example, vehicle navigation systems, or the sensors that provide information on your tire pressure and maintenance schedule. These are computers embedded in your car that turn analog information into digital information. STM specializes in applications specific integrated circuits (ASIC). Its products are not only in the embedded computing space, but also translate analog information to digital, like touchscreens. There are some major players in this broader space. Texas Instruments Incorporated (NASDAQ:TXN) is the biggest of the bunch. But, STM is going head-to-head with TXN in the IoT and automotive sector. They’re somewhat complementary, though, which is a good thing given that TXN is about five times the size of STM by market cap. While a Switzerland-based company, STM has been in the U.S. market for a very long time. Its European roots, however, are a bonus since it has significant access to European automakers and other industries. In the U.S., STM is a big player in the defense sector’s embedded computer market. As armed forces are looking to digitize their operations from the battlefield to the Pentagon, STM has found a good deal of business in this sector. Moving forward, this will be an important sector for STM stock since equipment built to military specifications usually commands higher prices and better margins. Given the amount of work that it will take to upgrade the U.S. military — as well as military forces in Europe and beyond — this will add to that strong growth in embedded computing. For now, a U.S. presence is a great benefit, but in coming years STM’s global exposure will be the real growth engine. At this point, 30% of embedded systems revenue comes from the U.S. This electronics company is in the right place at the right time. But, that means 70% comes from outside the U.S., and STM is already a player in those markets. Along with that, there is the growing potential of IoT and the automotive sectors, both of which are big customers for STM. Up more than 65% year to date, but only trading at a current PE of 35, STM may not look like it’s a bargain, but it is certainly still punching above its weight. Article printed from InvestorPlace Media, https://investorplace.com/2017/09/can-stmicroelectronics-stm-stock-continue-run-up/.